A busy few days lies ahead for Ballymore Stables - runners at four different tracks from Friday to Sunday, kicking off with Garud (pictured) who takes his place in the Wodonga Cup. In great form - placed at three consecutive outings including two in Listed company - Garud didn't have any luck in the Eclipse Stakes last time out and Michael Moroney is confident of a much improved showing down in class and back in distance. "We also had him in Sunday's Pakenham Cup but this looked the easier option. He can go forward from that gate (barrier six)," he said, adding that "he has a pretty good record at the mile." Yet to miss a placing from three runs at the trip, Garud "has been in great form apart from Sandown where he endured a torrid run. We expect to turn that form around pretty quickly." We have another couple of runners on Saturday; Our Valdivia at Moonee Valley and Strike Force at Rosehill. Stripping fitter for his first up run over 1400m, Our Valdivia is suited up to the 1600m of the Ranvet Handicap and Moroney has been very happy with his recent track work. "He usually races well second up and he has improved. He has been pleasing us and we expect him to run a nice race." Enroute to Queensland for the rich Magic Millions race day in January, Strike Force has had a break since a luckless run in the Caulfield Guineas Prelude in late September. "He is one of a group of very nice three-year-olds who we think are black type class," said Moroney. 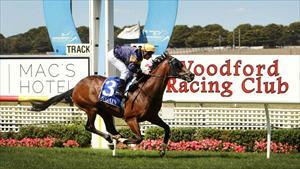 "He has trialled well in Sydney and we have been very happy with him. He has a bit of a tricky gate (barrier nine) but he has good gate speed so he can put himself right into the race." Sunday's Victorian meeting is at Racing.Com Park and we have Malfum in the opening event, a 1400m three-year-old maiden. "He is a nice staying sort of horse who has just kept getting better. He has taken a while to strengthen up and whatever he shows this time in he will improve further on next time in but he can run well."